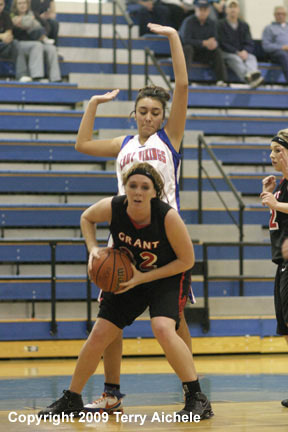 Naomi Castanon, left, and Jessica Vandever, right, battle with a Grant Union for a rebound. UMATILLA - The Umatilla Lady Vikings defeated Grant Union 53 to 49 on Saturday, February 7, 2009. The Vikings started off slow in the first half. Umatilla found their game in the second half outscoring the Outlaws 28 to 18. The Vikings had strong play down the stretch by Jessica Vandever, Ashley Vandever, Kasssie Kennedy and Naomi Castanon. The teams exchanged leads during the first period with the biggest lead being three by the Vikings in the opening moments of the game. Vikings scoring in the first included Naomi Castanon, Katelynn Cranston, Catherine Routson and Jessica Vandever. 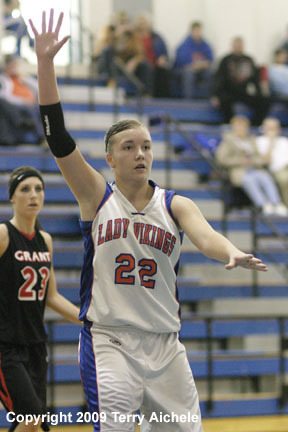 Grant Union outscored the Vikings 19 to 14 in the second period to take a 31 to 25 lead at halftime. 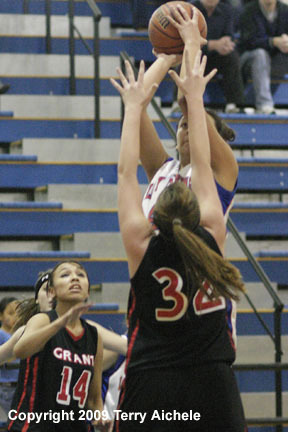 Umatilla outscored Grant Union 18 to 7 in the third period to a take a five piont lead, 43 to 38. Viking scoring included Castanon, Jessica Vandever, Ashley Vandever. Castanon was responsible for about six points in the period. Lindsay Harris scored off a steal by Jessica Vandever which closed the Vikings to within one point. Castanon then hit a short shot to give the Vikings a 36 to 35 lead. Grant Union never regained the lead as the Vikings played smart ball and kept control of the momentum to the end of the game. Vikings scoring in the fourth included Harris, Ashley Vandever, Jessica Vandever, Castonon and Routson. With 51 seconds to play the Outlaws had climbed to a tie at 49-49. A roar went up from the crowd when Castanon hit a shot giving the Vikings a 51 to 49 lead. 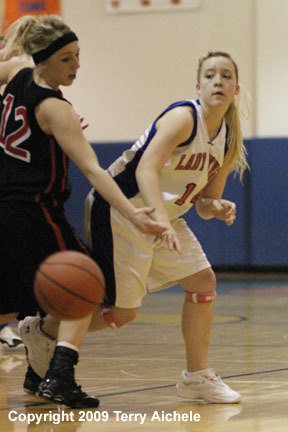 Routson sealed the game when she hit two freethrows with about two seconds to play. The Lady Vikings showed determination battling back to take the game. Jessica Vandever took on a more commanding presence during the game and showed a lot of leadership. Sophomore Naomi Castanon showed her ability to play post has improved through the season and can take control when needed. 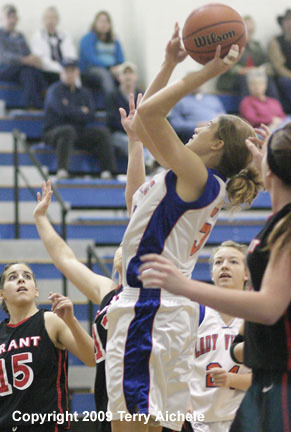 LEFT - Sophomore Catherine Routson of Umatilla takes a shot during the game with Grant Union on Saturday night. 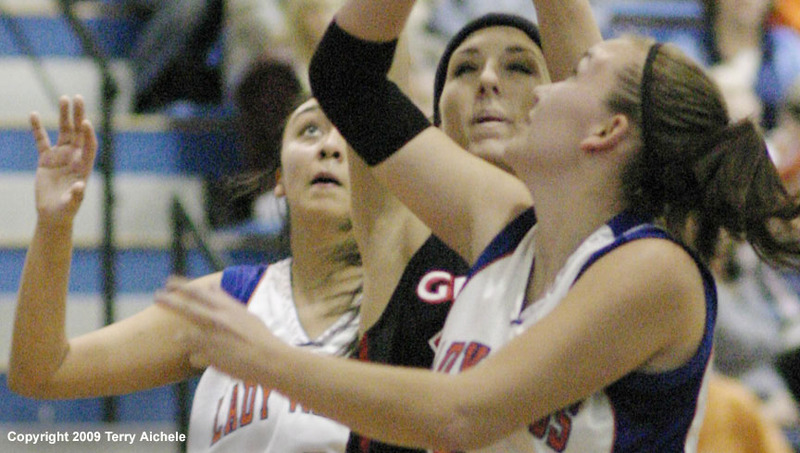 RIGHT - Naomi Castanon of Umatilla takes a shot over Melissa McCloskey of Grant Union. 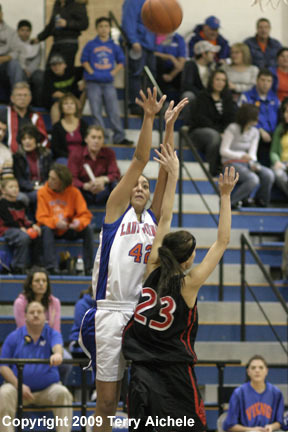 LEFT - Umatilla senior Jessica Vandever had a good game on Saturday. RIGHT - Naomi Castanon of Umatilla stretches high to block Melissa McCloskey of Grant Union. LEFT - Katelynn Cranston of Umatilla tosses a bounce pass past Grant Union defender Nicole Lane. RIGHT - Naomi Castanon of Umatilla lets fly with a jump shot during the game on Saturday.